The Flash finally defeated DeVoe in the season finale. This plot line hardly justified this long a story. A thirteen episode season, or dividing the season up as Agents of SHIELD often does, might have been more effective. Perhaps the most interesting aspect of the show was the revelation that the mystery girl is the daughter of Barry and Iris, who has traveled back in time. Presumably this foreshadows the next season. 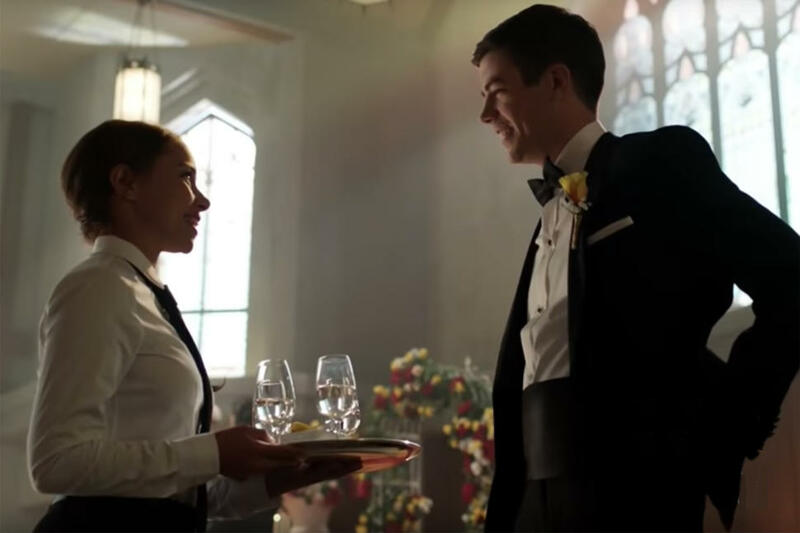 When she said she made a mistake, I wonder if the mistake was time travel itself as on The Flash it always has negative consequences, or if she is referring to something else. What can you tell us about this huge mistake she’s apparently made? Well, I mean, a lot of it is obviously all about next season. Barry certainly learned his lesson about time travel and the effects that it can have. She comes back for a specific reason, not only to see her parents and meet everybody on the team, which you saw all throughout the season — there’s four specific times that she came back, and you’re gonna learn about why she chose those four times and how they’re gonna play into not only the mistake that she made, but the consequences for somebody like her, a speedster traveling from the future to the past, and what that means for Barry and the team. Speaking of those interactions, are there specific reasons why she’s avoided Iris and why she was so cold to Caitlin? Yeah, she comes from 30 years in the future, so 30 years from now, a lot has happened. She’s privy to information that nobody else is, so her experience in the future is certainly different than where everybody is now. 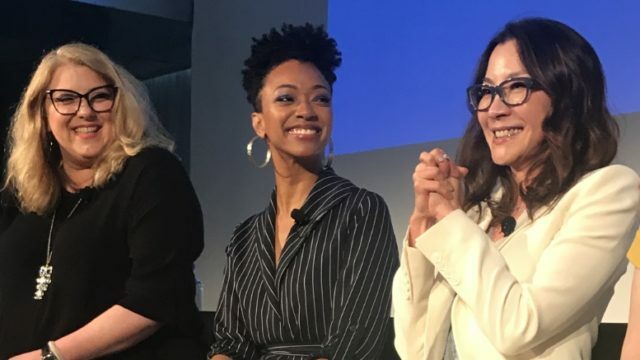 A lot of next season too, you’re gonna see this relationship between Barry and Iris and Nora, so we just wanted to give the audience a little glimmer into what her reaction is to everybody. If you go back and watch all of the ways that she interacted with everybody, you can get a nice little sense of what her relationship is with everybody in the future. What can you tease of Caitlin’s journey next year? That flashback seemed to indicate that Caitlin’s father already knew about her Killer Frost side, which made me think she may have gone on to accidentally kill her father. Am I jumping to conclusions? One of the themes for next season is family. When you’re dealing with a show that jumps around, obviously with Barry, Nora, and Iris, it’s gonna be family, with Joe and Cecile and the new baby, there’s family, and then Ralph is part of this new family. And then with Caitlin, she had one understanding of where her powers came, and you’ve met her mother in the past seasons, you got a little glimpse of her father. But there’s gonna be a new dynamic with Caitlin and her family in season 5. You said there would be a hint at the new villain for season 5 in the finale. What happens more often than not is, we shoot a lot of stuff in the finale that gets cut. So for time we had to cut it. It was gonna be the tag at the end of the episode. But we’ll get it out; the public will see it before the season starts. Maybe we’ll release it online or at Comic-Con. But yeah, it just it came down to a time thing. Harry has left, but presumably Tom Cavanagh is sticking around. Anything you can say about the new Wells we’ll meet next season? I don’t want to tell you yet who he is, but when I was up there in Vancouver shooting for the finale, I talked to Tom for quite a bit about it. We landed on a pretty fun and interesting new Wells to join the team. Was it always the plan for Ralph to actually still be alive? Oh, yeah. From the beginning of the season, we wanted DeVoe to hop into other people and then to finally get to Ralph, and really play it like he was dead. That was what we walked partly through at the beginning. So it was always the plan to kill him and then bring him back to join the team at the end, and then to be part of the next season. If Ralph is alive, any word on the other bus metas? No, they’re toast, they’re all toast. I looked at the season finale of Arrow last week. 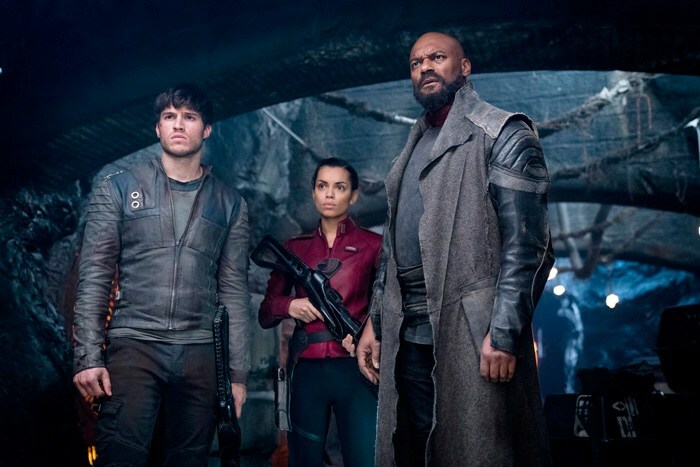 Krypton ended its first season with a huge change in the timeline. For a while there was some ambiguity as to whether it made sense to support General Zod’s attempts to stop Braniac, even if that would mean no Superman on earth. By the end of the season it was clear that General Zod’s real goals were not beneficial to Krypton, and presumably we might see an attempt to repair the timeline in future seasons. Plus there was the introduction of clones, which might also be significant in the fate of the planet, and Doomsday is breaking free. Seg-El defeats Brainiac by tricking him into stepping into range of the Phantom Zone projector, but Brainiac manages to drag Seg into the hellish prison dimension along with him. Nevertheless, the “bottling of Kandor” is prevented, and Brainiac is defeated. The problem, of course, as Adam Strange repeatedly pointed out during the season, is that Brainiac needs to be allowed to succeed in order for the removal of Krypton to destabilize the planet’s core, leading to its destruction and Superman’s eventual birth. With Krypton’s survival now apparently assured, Superman no longer exists, and the Zod crest overwrites the familiar Superman one, and suddenly, Krypton’s future is not as set in stone as it once seemed. Things are so drastically different now that even the nature of the Phantom Zone itself might not be something that Superman fans are familiar with. Seg-El’s victory over Brainiac is bittersweet, but it could be worse. He could be Adam Strange. Adam is trapped back in Detroit, which has been bottled by Brainiac in his absence. Its residents are frozen in time, and Adam, thanks to the Zeta Beam and the fact that he wasn’t there when Brainiac took the city, is awake and aware of everything happening. But even here, there is a sign that the timeline has changed around him: a giant statue of General Zod, in Detroit, where there certainly shouldn’t be one. But make no mistake, Adam is not only screwed, he knows just how screwed he is. Welsh told us that Adam’s memories have not been overwritten by the timeline change, so he knows exactly what is wrong. But the fact that Brainiac was able to grab a present-day Detroit and bottle it means that his threat hasn’t been completely neutralized 200 years in the past. One way or another, we know that Brainiac will return. Fortunately we received word last week that Krypton has been renewed for a second season. 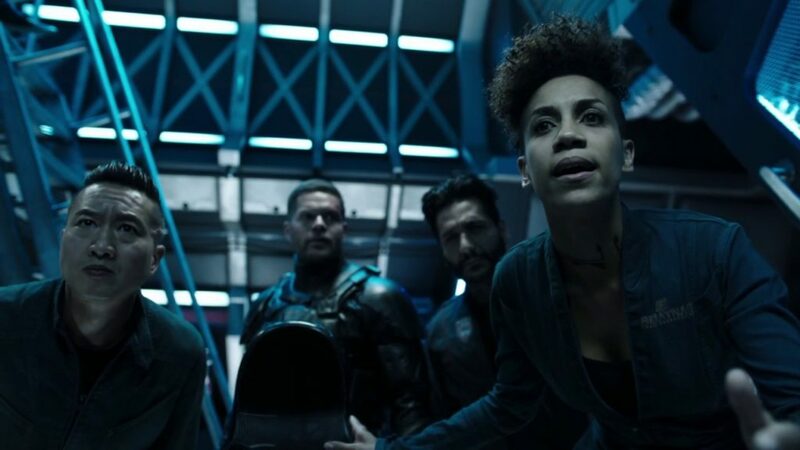 While Syfy did not renew The Expanse, Amazon has decided to save the show, and will be picking it up for a fourth season. If anyone gave up on it earlier, the show has become even better the last few weeks. There was also the conclusion of a major plot line and a time jump, making last week a good point to pick up the series. As for Timeless, the show seemed doomed a couple weeks ago after NBC didn’t renew the time-travel drama for a third season along with its other last-minute pickups. On a conference call with reporters, NBC entertainment chairman Robert Greenblatt didn’t give the obligatory “we love the show but…” when cooly explaining its fate would be decided after the finale aired. When its ratings barely budged for that last episode, odds seemed to go even lower. But then something happened. Which is to say, nothing happened. If NBC was going to cancel the show, why wait? The delay could suggest efforts are being made on some level to keep things going. We’re hearing there should be some resolution relatively soon (if fans are unlucky, then perhaps during the Memorial Weekend bad news dump). Fans are pushing to #renewtimeless, and there is evidence of interest in the show. A deleted scene which was posted on line is now up to 155,000 views as of the time of writing this post. More on the Timeless finale here. Comicbook.com has news about the next (and final) season of Gotham, which had its finale last week. 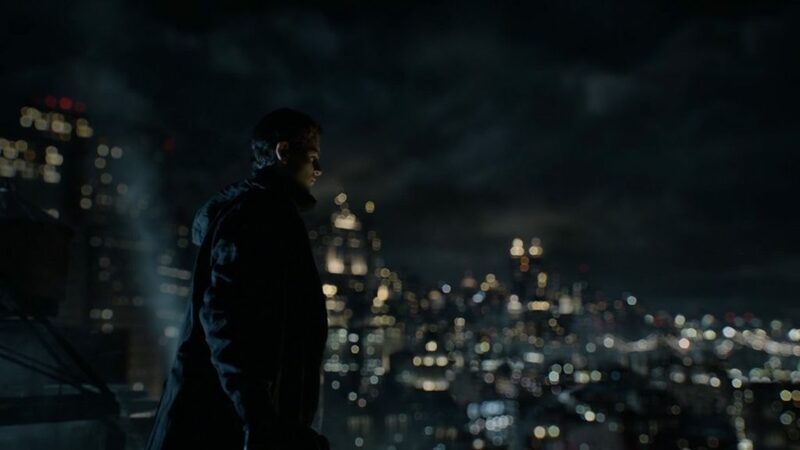 Following the earth-shattering events of Thursday’s Season Four finale, ComicBook.com had the chance to talk with Gotham executive producer John Stephens about what’s to come when the show returns, and which popular comic series would be adapted in the final season. “You mean besides ‘No Man’s Land”‘?” Stephens joked. Given that the current season ended with the complete destruction of the city, it was pretty safe to assume that “No Man’s Land” had just begun. However, as Stephens continued, he mentioned that one of the New 52 arcs would come into play. For those who are familiar, Batman: Zero Year came from the minds of Scott Snyder and Greg Capullo during their popular run of New 52 Batman comics. The story, particularly the second arc “Dark City,” was all about Bruce’s initial time as Batman, and his efforts to stop The Riddler from taking over the city. I don’t want to spoil, but I think there are clues. It takes too many months to figure out how to do this. Their beautiful performances are crafted, then they are in post, so I am not going to tell you everything right now. We leave clues. Watch the final episode at the end of the [first] season as to where we are going. I can promise you that the characters that you fall in love with, you are going to get to know them better. We get much deeper into character exploration this year and we will meet some new folks. We love our group and you are going to learn more about them. I love the box that we are in, because it can be so overwhelming when you look at the entire universe of Star Trek … but we were able to focus on somewhere on the timeline and we know that this happened before and this happened after. They say boundaries and restrictions can be good and for us it was good. It also gave us an opportunity to lay in some easter eggs and we feel very, very, very strongly about making sure that we fit into canon, making sure that there are not any loose ends that may be the story that is being told right now, but we are going to fit into that timeline. A lot of consideration has been put into it. As far as shooting a show starting in 2017, we have to also realize we have caught up with The Original Series, like everyone talks about iPads and PADDS and stuff like that. We just have to make sure that it makes sense. We have our art director and prop designer and everyone who is madly in love with our show and also all the shows, and so they are paying attention to that. The cast of Discovery is also going to appear on Carpool Karaoke. Tig Notaro has discussed her upcoming role in the second season. 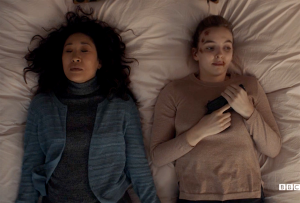 Moving away from science fiction, another highly recommended show, Killing Eve also had its season finale. I’ll avoid any spoilers assuming for the benefit of those who have not watched the show, but the finale emphasized that this show is more about the relationship between the two leads than a traditional detective/spy series. However, like a traditional series, the first season opened up a new layer to the story which provides plenty of material for a second season without it feeling like a repetition of the first. Upcoming this week: the series finale of The Americans, and the season finale of iZombie.